Click Start And Let the Magic Happen! Imagine if you could press a button and activate your HIDDEN POWER. That’s all you had to do. Press a single button and your true inner POWER would be ACTIVATED. The secret to boost your Mind Power, Performance, Success and Overall Health is a just a click away..
Would you like to have charisma and confidence like James Bond. Just press a single button. Want to activate your inner Einstein. Just press a single button. How about increasing your wealth. Again, just press a single button. Nice. What IF you could just make all that irritating PAINFUL work disappear and just wake up in the morning to discover your dreams turned into a reality…..? YES, just press a single button. Can you imagine just how effective and powerful that would be? That would be LIKE MAGIC because….Yes, you only press a button and your mind is PROGRAMMED with astonishing new skills, beliefs and talents. I know this might sound impossible, but your brain is designed to bring you all that… and more! 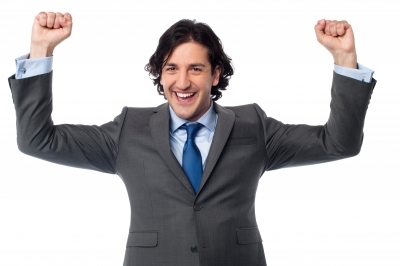 Yes, your brain… You are designed for success! Create Powerful New Habits— Imagine developing a countless stack of brand new habits, one right after the other, and transforming your life completely.. 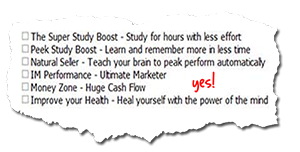 Learn 10x faster!— Imagine how your life would be massively enhanced, if you could learn that particular knowledge that you’ve been wanting to learn..
Boost Your Energy— Imagine feeling so much energy that you can’t wait to get out of bed each day! No more fears— Imagine Your Life Without Fear & with mindset of a true winner..
Boost your creativity— imagine having clear focus & having genius ideas.. THE LATEST MOST ADVANCED TECHNOLOGY THAT HELPS TO REPROGRAM YOUR MIND — while you use your PC. 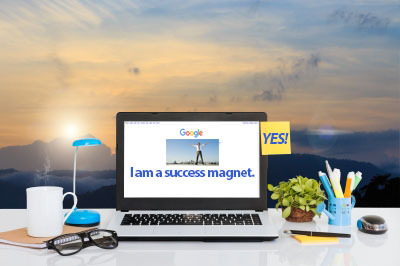 Adding new or editing affirmation messages is YES SUPER EASY with built-in easy to use Editor! 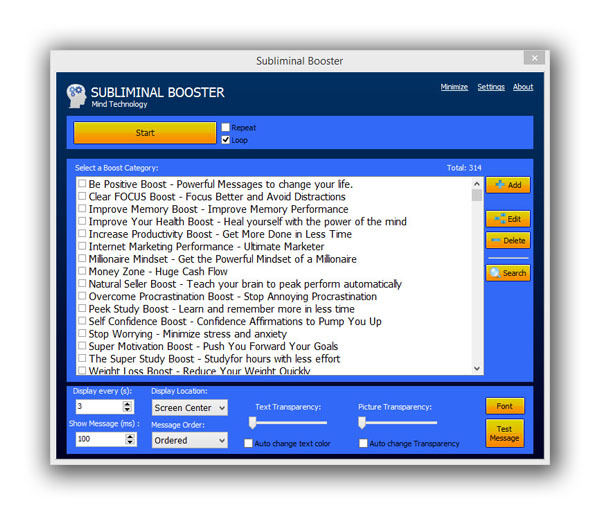 SUBLIMINAL BOOSTER displays affirmations on your computer screen at either conscious or subconscious levels. It works in the background while you use your computer. Choose from over 300 powerful pre-written affirmation categories or create your own! And let it run. Yes, that is all you have to do! SUBLIMINAL BOOSTER is flashing messages that you select directly to your subconscious mind with incredible speed! Messages will be visible for only a split of a second! Enough to be picked up by your subconscious! You can Achieve your desired goals using our Powerful Subliminal Technology in the form of the most Powerful Subliminal Software on the market. This powerful software will help you to direct your attention on a subconscious level using the enormous power of Subliminal Messages. SUBLIMINAL BOOSTER works even if you don’t believe it works! When I started with subliminal booster, it was an amazing wake up call for me because I’ve been doing what I thought was personal growth but subliminal booster gave me more power and more help to develop myself and to grow. If you want to be better, get the program and be better yourself. What is Subliminal SUBLIMINAL BOOSTER? 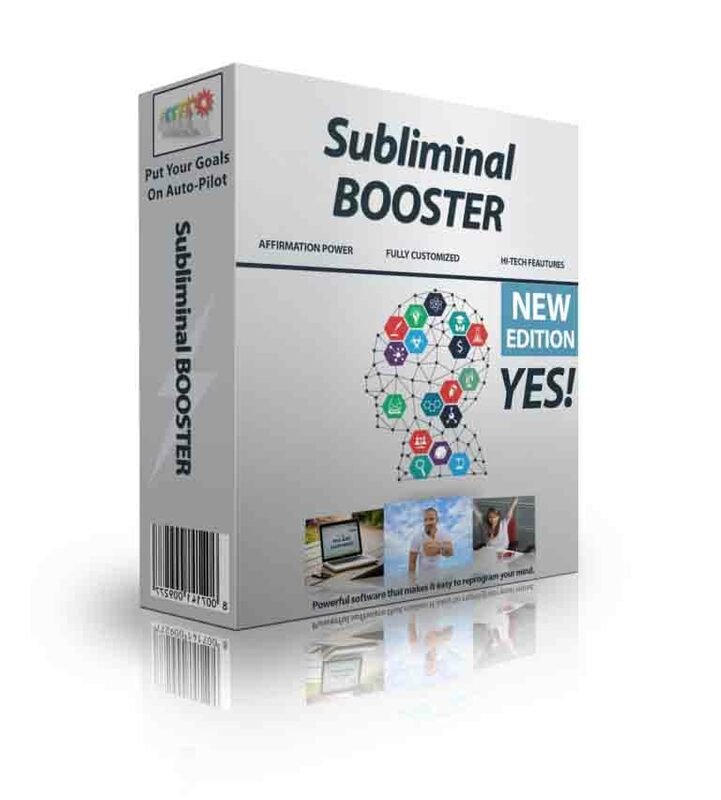 SUBLIMINAL BOOSTER is a Powerful, State-of-the-art, Subliminal Messaging and Images Windows Software Program that helps to reprogram your mind – while you use your PC. YES SUBLIMINAL BOOSTER is Powerful and Easy to use: you just select the categories and press “Start” button. Watch the following video on its use. Affirmations can be text messages or pictures or both -Subliminal booster software supports textual messages and pictures. Add, Edit or Delete your affirmations -Built-in editor allows a full and easy customization of all affirmations. Search through affirmations -Finding the right affirmation in the database is easy thanks to advanced searching mechanism. Create new Categories -Need new category where you will add your special affirmations. No problem just click a button. 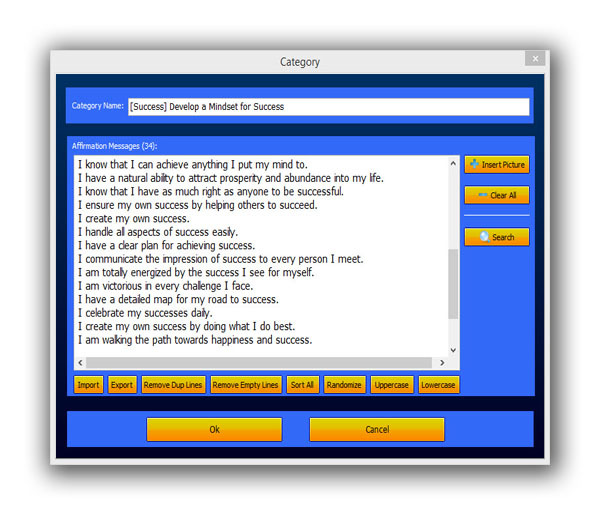 Choose Display Location -Affirmations can be shown on a diferent screen location. Message Display order -Affirmations can be displayed randomly or one after another. Repeat or loop affirmations -How many times should affirmations repeat or loop until you click a stop button. Display messages time and duration -How long should affirmation be visible and pause between them. Select Font of displayed affirmations -Fully customized font size,type,color,etc can be easily set. Set message transparency -Set a degree of transparent visibility for messages. Auto change transparency -This option will set a random degree of transparency every time. Auto change font color -This option will set a random font every time. Auto start with windows -Program can run its self everytime you start a computer. Minimize to tray -Program will auto hide to tray icon when you start it. Tray icon popup window -Popup menu allows you to control the program through tray icon and main interface. Auto saved settings -All settings, edited affirmations and categories are auto saved and loaded each time. A brief history behind subliminal technology..
Subliminal Technology is effective simply because it bypasses the conscious mind, and that is why subliminal suggestions or affirmations are much more effective than ordinary suggestions or affirmations. 1943: Subliminal messages were periodically embedded in radio, movie and tv programs. 1957: James Vicary, a market industry researching specialist, reported that by flashing the words “Eat Popcorn” and “Drink Coca-Cola” during a movie for a fraction of a second, he considerably boosted the sale of these snacks. 2006: scientific studies have revealed subliminal messages might work in advertising after all, in particular circumstances. 2007: Subliminal messages may also increase academic performance. In a 2007 study, research workers flashed college students concealed words associated or unassociated to cleverness, such as “creativity” and “skills,” respectively, prior to a practice exam. Individuals who watched the concealed words performed better on a midterm one to five days later. Early 2000s: Scientific studies proceeded to show that subliminal messages do impact our thoughts. 2010–2015: Brain scanning images have shown that our mind reacts to subliminal messages in considerable ways. Activity levels change in the amygdala, which interprets feelings, the insula -associated with consciousness, the hippocampus -associated with handling memories) and the visual cortex. SUBLIMINAL BOOSTER is applicable to any area of your life that you want to improve or change with built-in over 300 categories it is covering practically every area of life. SUBLIMINAL BOOSTER works silently while you do anything else on your computer: After selecting the categories, you can minimize the software and this will work silently without you noticing. You can also select the option that makes the software to start automatically when Windows starts. AWESOME FREE BONUS INCLUDED WITH EVERY PURCHASE TODAY! FREE Bonus #2 – “1500 affirmations and reflections ” – Supreme affirmations available in 30 categories. FREE Bonus #3 – “Breathtaking inspirational Wallpapers” – With quotes to motivate you on your path to achieve your dreams! FREE Bonus #4 – “The Power of Positive Thinking report!” –Discover what “positive thinking” actually is and how it help you. Special discount price of just $47 … before it is too late! P.P.S Also bear in mind, that you are getting minor updates free of charge. So grab this special price while you can! If this software isn’t everything you were anticipating, simply inform me within 60 days and I will return your money in no time. Subliminal Booster will Work on any on any computer that runs on Windows operating system. Please read the Frequently asked questions (FAQ) to find out more about the Subliminal Booster.